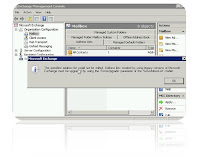 After migration exchange 2003 to exchange 2007, I run into some little fix issues as I solve them I am posting here for others to gain some guidelines and quick solutions. This particular issue is well documented below MS link. "The specified address list could not be edited. Address list created using legacy versions of Microsoft Exchange must be upgraded by using the "forceUgrade" parameter of the "Set-AddressList" cmdlet"
To fix all Addressbooks at the same time, just delete all address books and run Setup /PrepareAD. All addressboks will be re-created without any errors. The posts on SMTP25.BlogSpot.com are provided “as is” with no warranties and confer no rights. The opinions expressed on this site are mine and mine alone, and do not necessarily represent those of any employeer or anyone else for that matter. All trademarks acknowledged.